From coast-to-coast, murals à la graffiti wrap buildings and bridges, and transform alleys with buckets of paint and spray cans of color. How popular is street art? 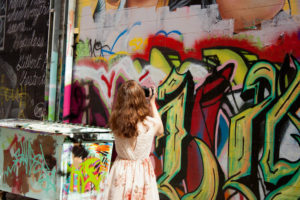 Street art is so popular that tour operators hop on scheduled graffiti tours. Or arrange customized excursions so groups can join artists by expressing themselves in creating a group mural. Art Alley, Rapid City, S.D. Downtown Rapid City has a thriving arts community. It includes an eclectic blend of Native American, Western and fine art, along with street art displays of natural and urban artwork including graffiti. Home to 15 galleries, the Dahl Arts Center and Art Alley, Rapid City brings out the art aficionado in visitors. For those who appreciate art in the great outdoors, free-form graffiti murals in Art Alley intermingle with pop art, abstract and cultural works. Since 2005, the alley has blossomed into a living tribute to freedom of expression. Artists with big reputations and bigger dreams are regularly given a free pass to make a mural in Rapid City. Plus: South Dakota is one of the World’s Top 10 Wildlife Destinations. Sign on for a Custer State Park tour to see roaming buffalo herds, bighorn sheep, antelope, even prairie dogs and “begging” burros. See President Calvin Coolidge’s Summer White House; it is in the park. 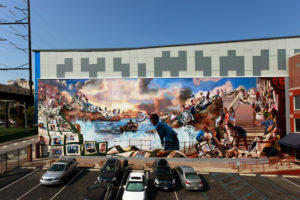 James Burns’s ‘Finding Light Within,’ Mural Arts, Philadelphia, Pa.
Philadelphia is regarded as “the city of murals” in the United States. With 3,600 murals gracing public places and spaces, no other location even comes close. The Official Mural Arts Tour is a favorite for groups. So is the story behind the start of the project that transformed graffiti into street art. The legacy of the arts program began nearly 35 years ago. 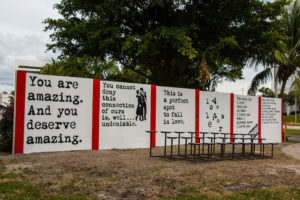 It was a grassroots idea to combat neighborhood graffiti. By using unused public space for public art, the change came quickly and residents and visitors were impressed. Mural tours host 12,000 people each year. Transport options include walking, bicycle or trolley. Customized tours are available and can include joining in a paint day. Plus: Some mural aficionados are more famous than others. His Holiness Pope Francis signed a pane of “The Sacred Now: Faith and Family in the 21st Century,” which was created by Cesar Viveros. LA Arts District, Los Angeles, Calif. 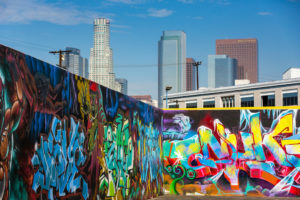 Artistic expressions found on the walls of the worn warehouses and brick buildings in the Downtown LA Arts District are in constant flux. While some murals are more permanent than others, there is a feeling that all of it is as ephemeral as graffiti. While most of the emerging Arts District in Los Angeles is comprised of older buildings, even new structures are graced with street art. The area is one of the hottest neighborhoods in LA. In addition to art, it is home to green technology, innovative architecture and entertainment venues. 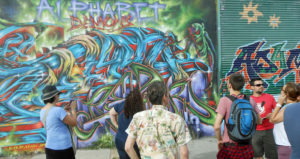 Guides for the two-hour, LA Graffiti/Mural Tour are also artists and are eager to share their world and the history of the neighborhood. Tours are available on foot or by bicycle. Plus: Recount the group’s arty adventure over a coffee or a meal in one of the fun stops in the Downtown LA Arts District. The Graffiti & Street Art Walking Tour from Brooklyn Unplugged steps off in the Bushwick neighborhood in Brooklyn. The murals are concentrated around an exhibition known as the Bushwick Collective, the center of aerosol culture in New York City. Murals and urban art fill the canvases created by exterior walls of businesses and buildings alike. Street Art & Graffiti Tour, Brooklyn Unplugged, Brooklyn, N.Y.
Brooklyn Unplugged walking tours typically last two hours and cover 1.5 miles. 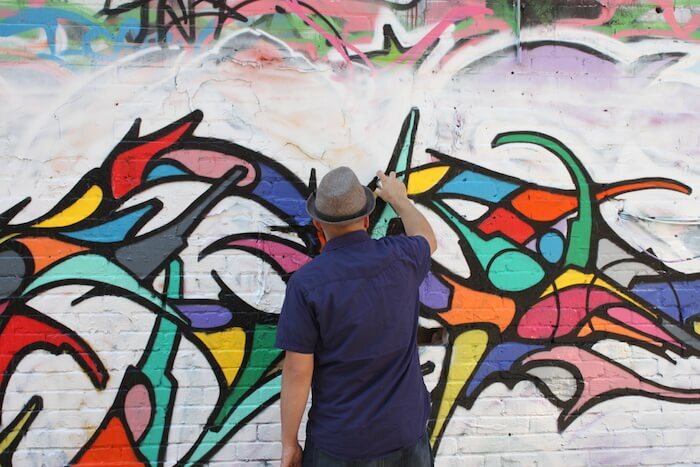 Plus: Brooklyn Unplugged offers a hands-on graffiti workshop presented by a professional artist. In Palm Beach County, groups can revel in art inside trendy galleries and museums or outside in view of murals on the back of a building, the side of an office complex or under an overpass. WRDSMTH mural, Palm Beaches, Fla. Thanks to the Cultural Council of Palm Beach County, the Palm Beaches is one of the nation’s hottest regions for public art. When making plans along this stretch of Interstate 95, be sure to tap into to the services of its Cultural Concierge. This concierge helps to identify cultural areas of interest to groups. “Art and culture in The Palm Beaches resides not only in its many world-class museums, theaters and galleries, but also in the communities and streetscapes that make Palm Beach County a vibrant, authentic center of creativity and community interaction with the arts,” said Bama Deal, cultural concierge. Plus: Cultural experiences expand beyond the canvas to live performances in music and theater.